This is a commission that I did for a friend. When I was a small child, I drew pictures of characters from Star Wars a lot. I don't think I drew Darth Vader very often, or at all. I always liked the good guys better as a kid. 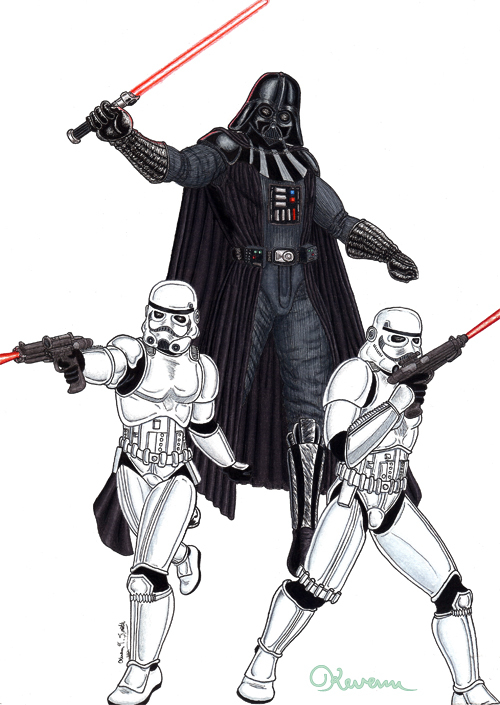 Earlier this year, I drew several Star Wars trading cards for a charity event to take place later this year, but I still hadn't drawn Darth Vader (or any Stormtroopers). This piece gave me the opportunity to tackle those characters and find my own take on them. At first, I got a little intimidated by the limited motion their armor would allow, but eventually, I figured out the way I needed to approach it that would work. 8.25 x 11.5 Bristol board.